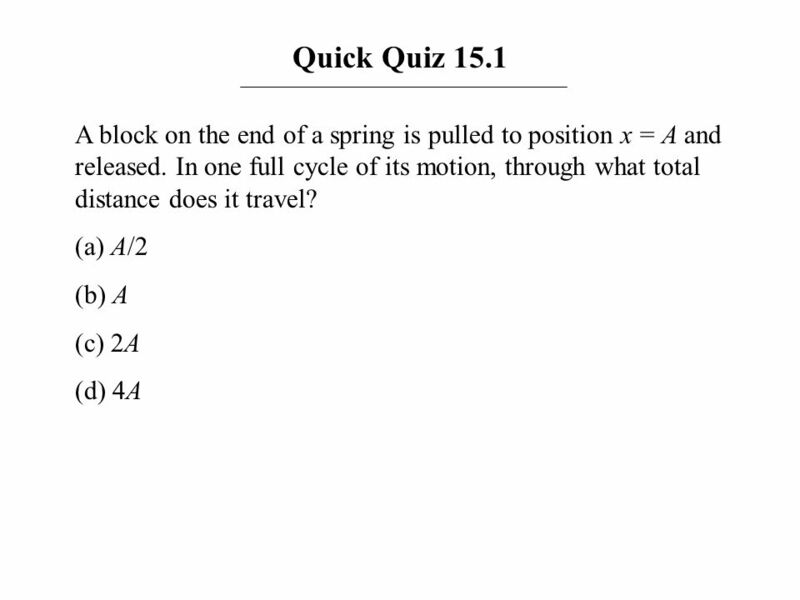 3 Quick Quiz 15.1 Answer: (d). 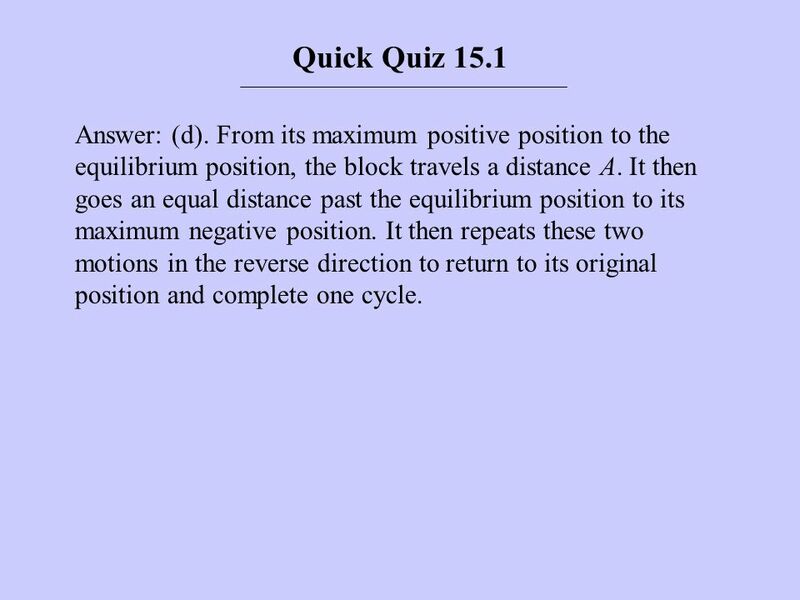 From its maximum positive position to the equilibrium position, the block travels a distance A. It then goes an equal distance past the equilibrium position to its maximum negative position. It then repeats these two motions in the reverse direction to return to its original position and complete one cycle. 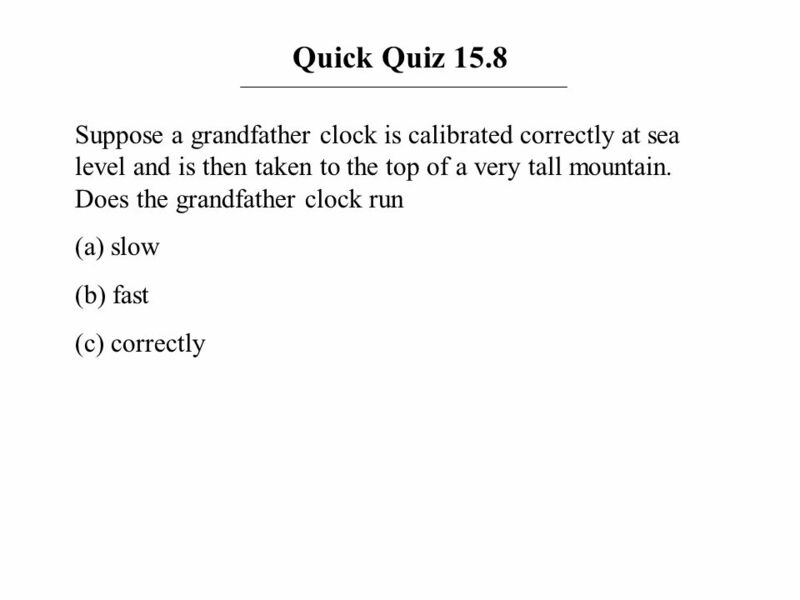 5 Quick Quiz 15.2 Answer: (f). The object is in the region x < 0, so the position is negative. Because the object is moving back toward the origin in this region, the velocity is positive. 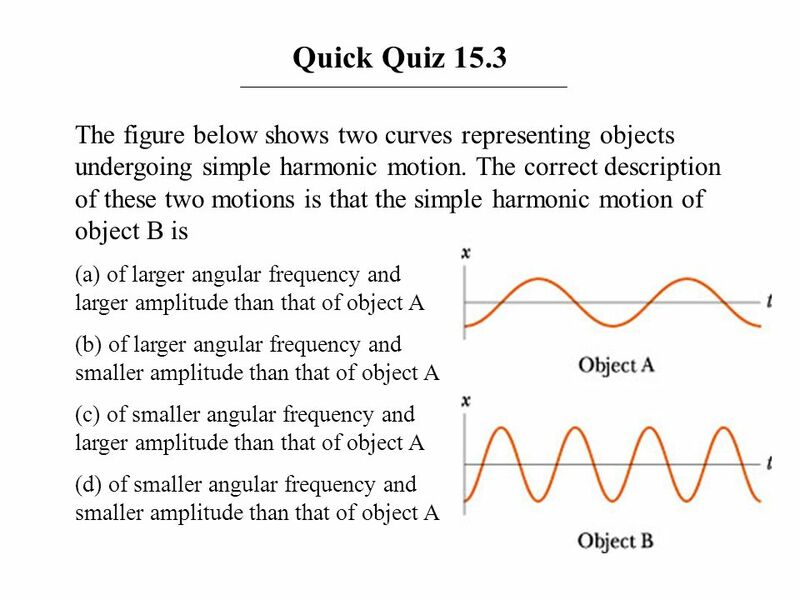 7 Quick Quiz 15.3 Answer: (a). The amplitude is larger because the curve for Object B shows that the displacement from the origin (the vertical axis on the graph) is larger. The frequency is larger for Object B because there are more oscillations per unit time interval. 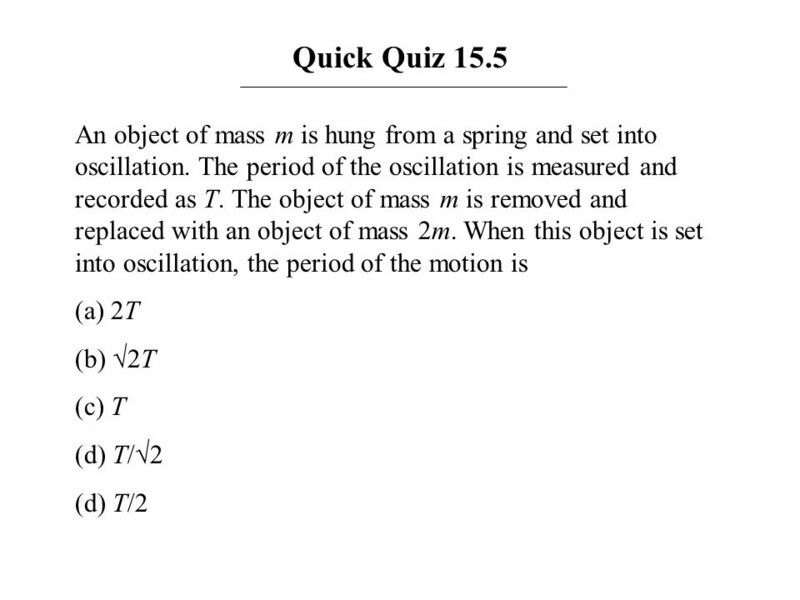 9 Quick Quiz 15.4 Answer: (a). 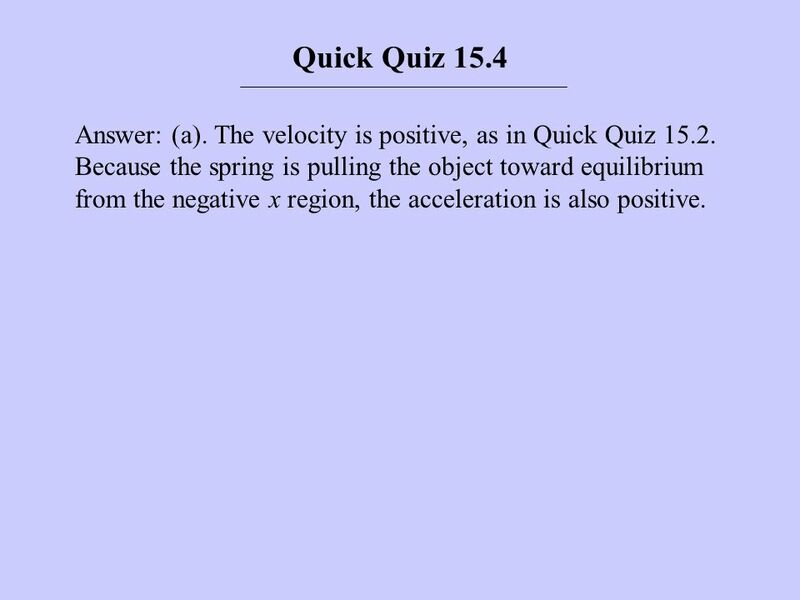 The velocity is positive, as in Quick Quiz Because the spring is pulling the object toward equilibrium from the negative x region, the acceleration is also positive. 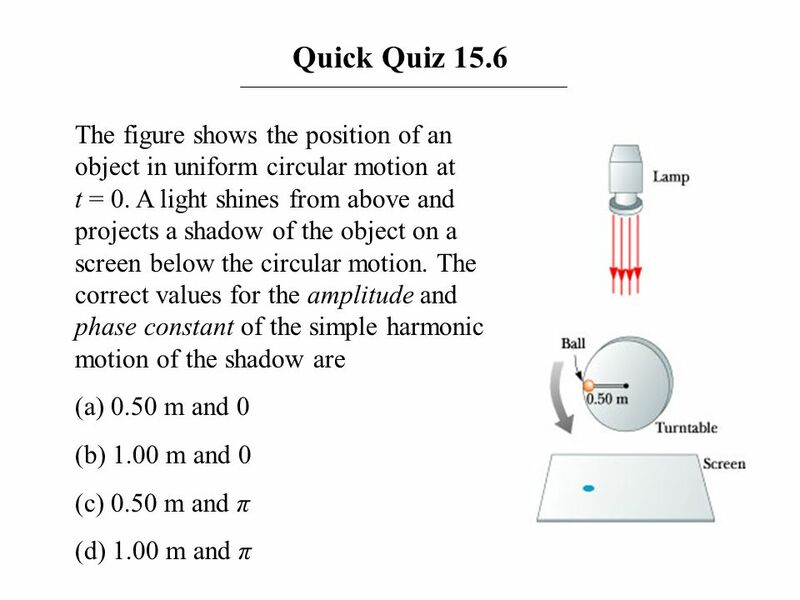 11 Quick Quiz 15.5 Answer: (b). 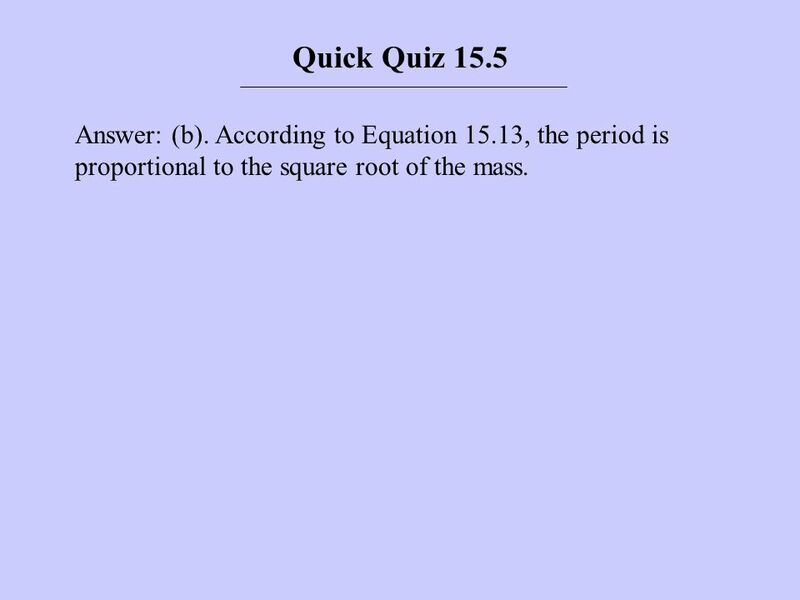 According to Equation 15.13, the period is proportional to the square root of the mass. 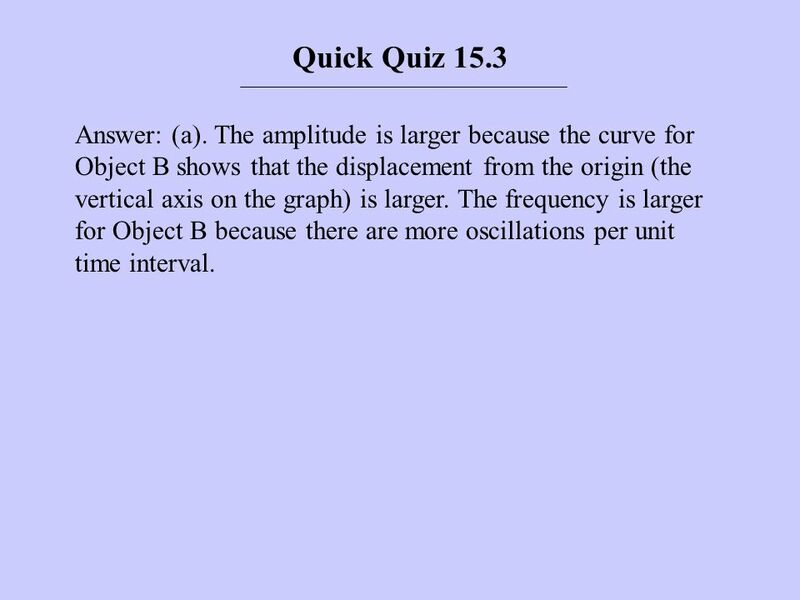 13 Quick Quiz 15.6 Answer: (c). 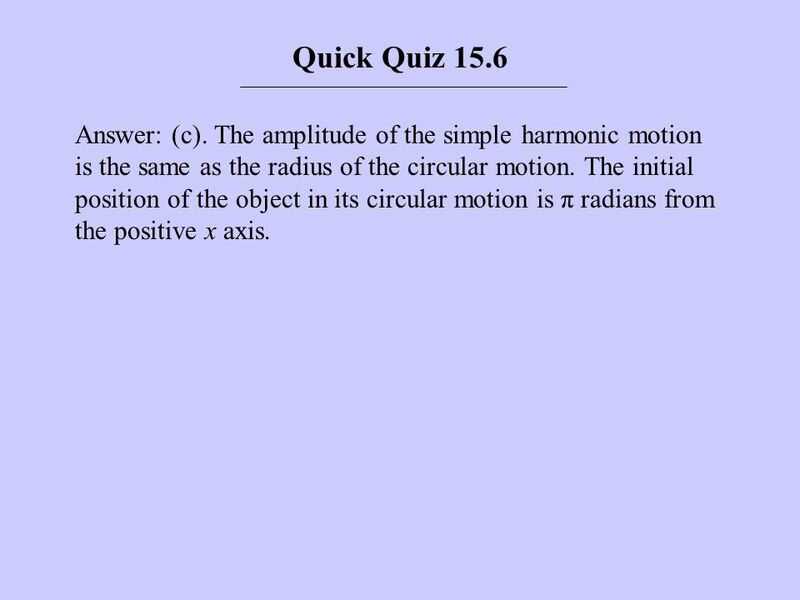 The amplitude of the simple harmonic motion is the same as the radius of the circular motion. The initial position of the object in its circular motion is π radians from the positive x axis. 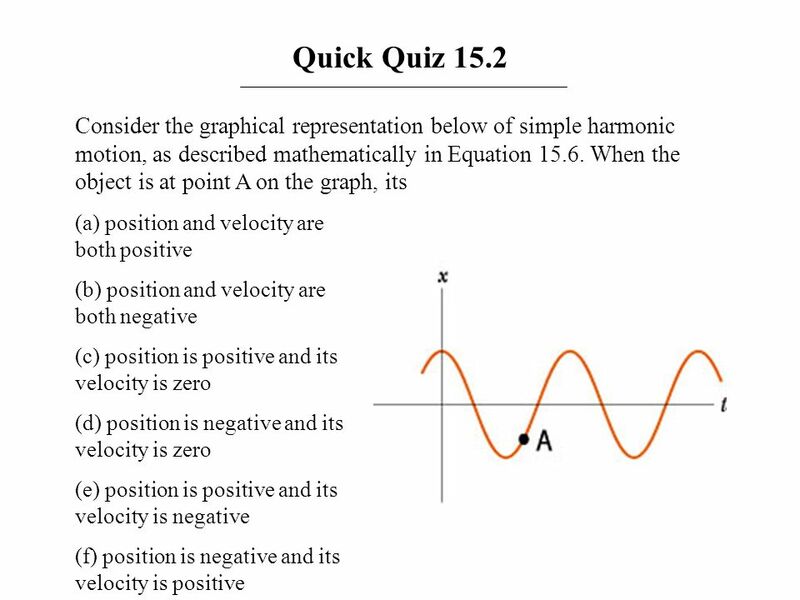 15 Quick Quiz 15.7 Answer: (a). With a longer length, the period of the pendulum will increase. 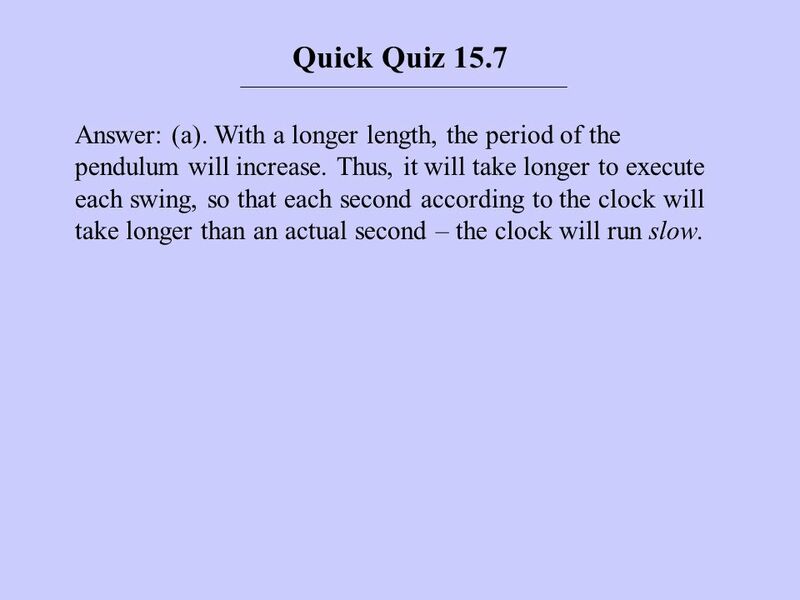 Thus, it will take longer to execute each swing, so that each second according to the clock will take longer than an actual second – the clock will run slow. 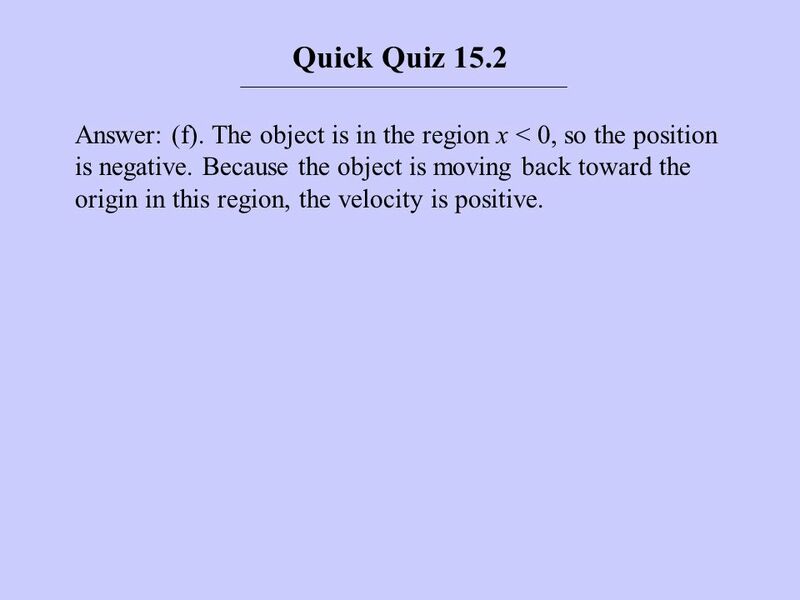 17 Quick Quiz 15.8 Answer: (a). 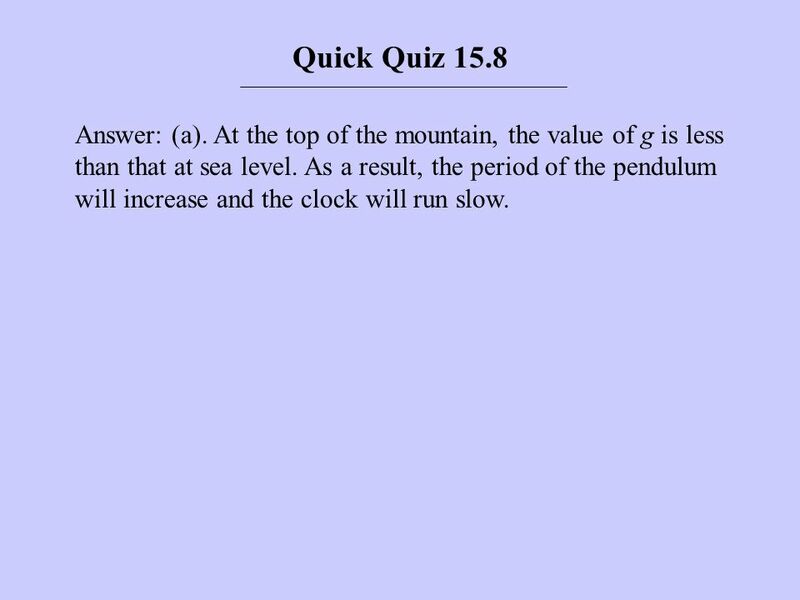 At the top of the mountain, the value of g is less than that at sea level. 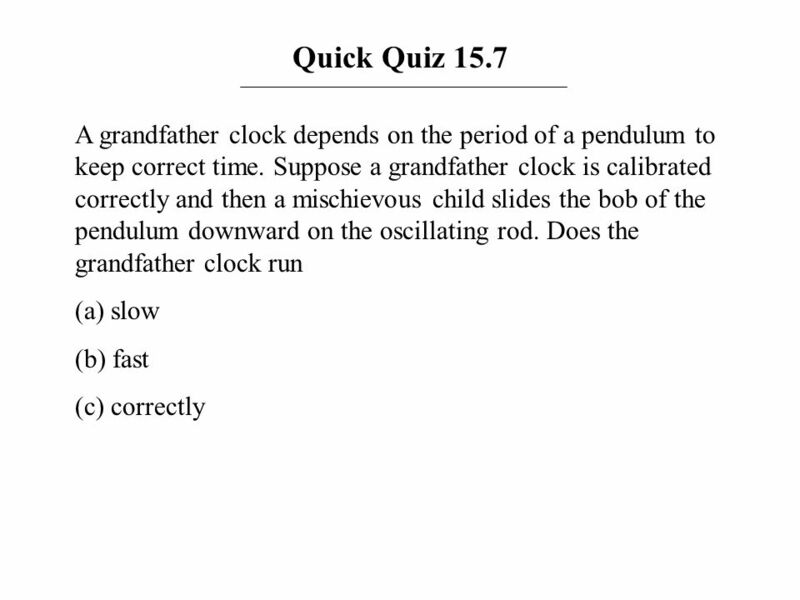 As a result, the period of the pendulum will increase and the clock will run slow. 19 Quick Quiz 15.9 Answer: (a). 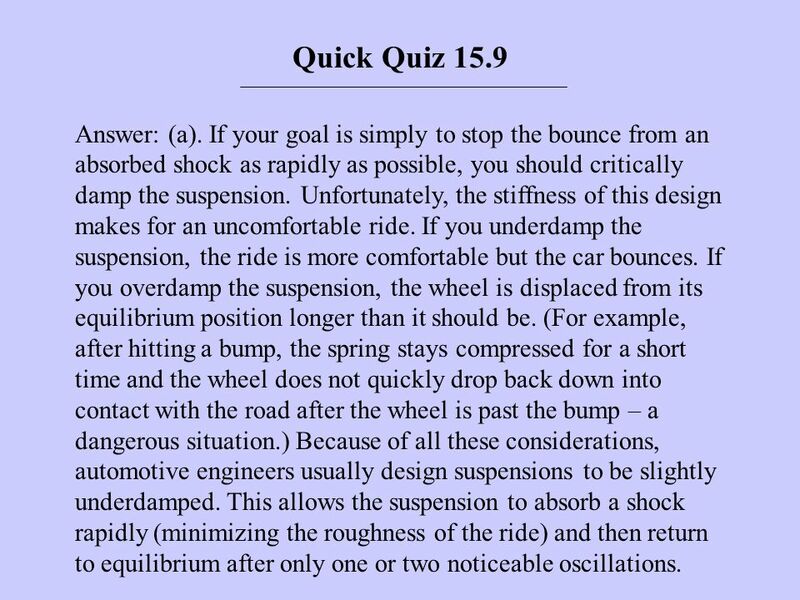 If your goal is simply to stop the bounce from an absorbed shock as rapidly as possible, you should critically damp the suspension. Unfortunately, the stiffness of this design makes for an uncomfortable ride. If you underdamp the suspension, the ride is more comfortable but the car bounces. If you overdamp the suspension, the wheel is displaced from its equilibrium position longer than it should be. (For example, after hitting a bump, the spring stays compressed for a short time and the wheel does not quickly drop back down into contact with the road after the wheel is past the bump – a dangerous situation.) 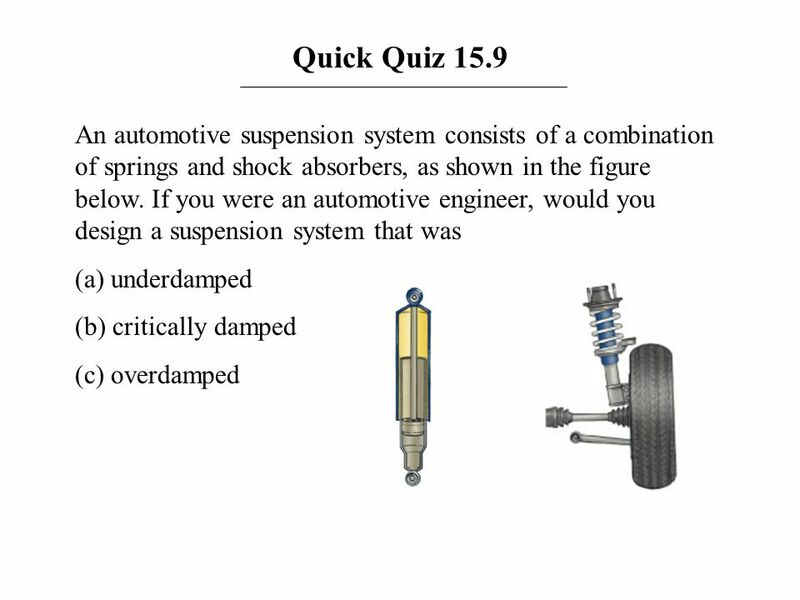 Because of all these considerations, automotive engineers usually design suspensions to be slightly underdamped. This allows the suspension to absorb a shock rapidly (minimizing the roughness of the ride) and then return to equilibrium after only one or two noticeable oscillations. 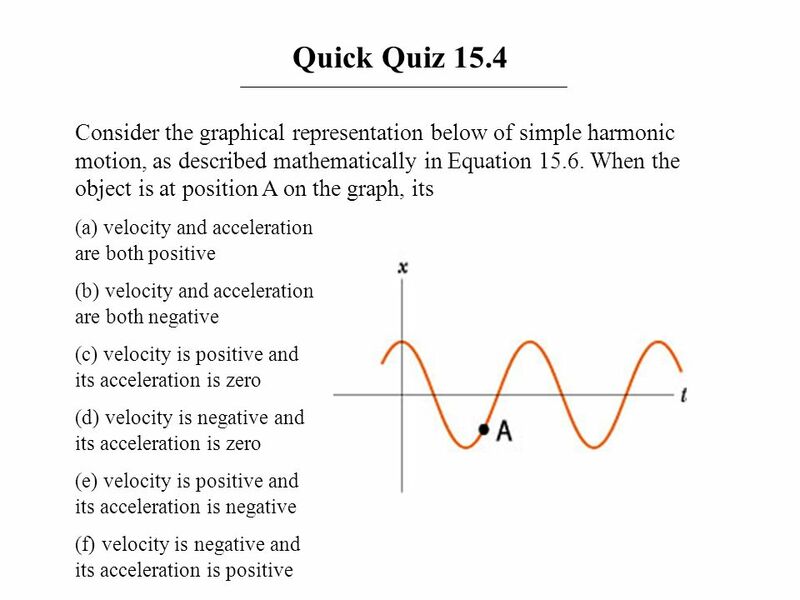 Download ppt "Chapter 15 Oscillatory Motion." Active Figure 15.1 Active Figure 15.1 A block attached to a spring moving on a frictionless surface. (a) When the block is displaced to the right of equilibrium. 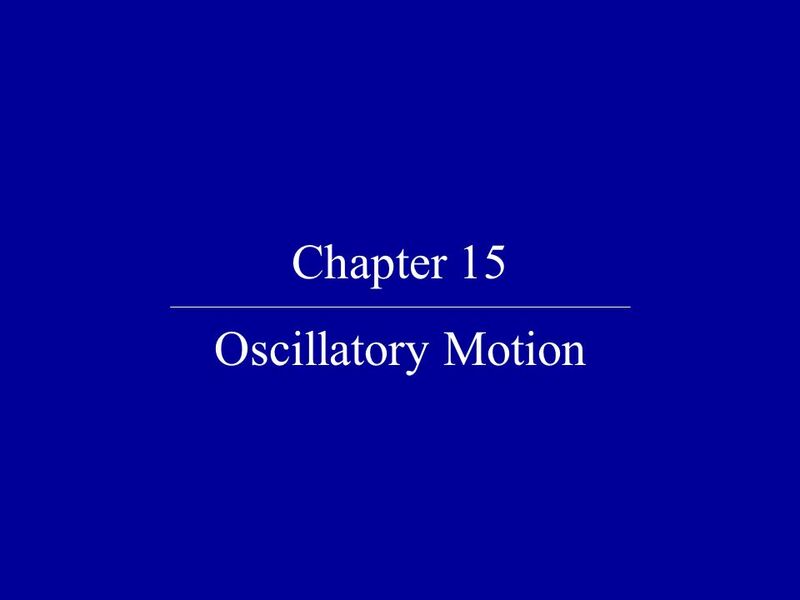 Chapter 15 Oscillations Oscillatory motion Motion which is periodic in time, that is, motion that repeats itself in time. Examples: Power line oscillates. 1 Oscillations oscillations_02 CP Ch 14 How can you determine the mass of a single E-coli bacterium or a DNA molecule ? CP458 Time variations that repeat. Chapter 14 Oscillations Chapter Opener. Caption: An object attached to a coil spring can exhibit oscillatory motion. Many kinds of oscillatory motion are. © 2007 Pearson Prentice Hall This work is protected by United States copyright laws and is provided solely for the use of instructors in teaching their. SIMPLE HARMONIC MOTION AND SPRINGS. SIMPLE HARMONIC MOTION Starts from a stable point or a rest point When an object is disturbed, it has a restorative. And Oscillations. Objectives Oscillations Typical example - a simple pendulum (a mass attached to a vertical string). When the mass is displaced to one.